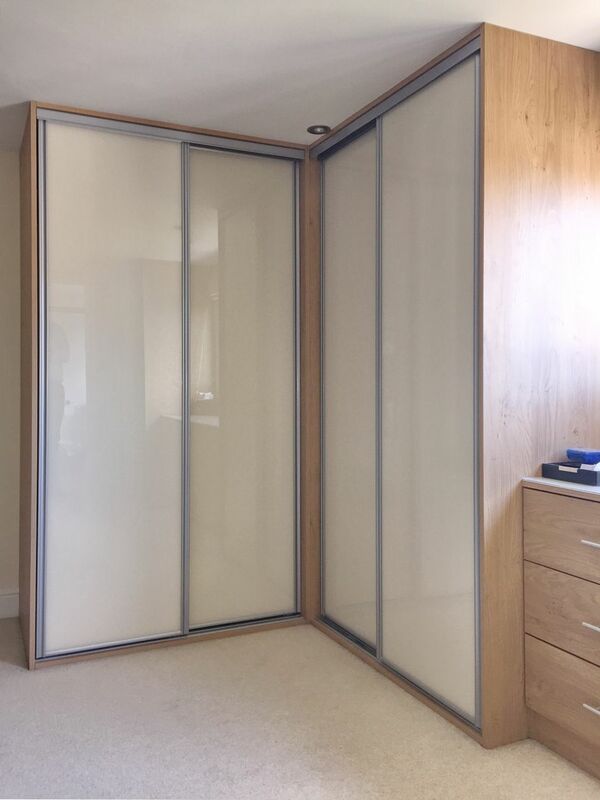 Our made to measure corner sliding wardrobes can be designed and created to fit more challenging rooms. Corner wardrobes have always been an interesting challenge. The corner of a bedroom will always have a degree of restricted access or a compromise on storage. Sometimes just the available space for a corner wardrobe can be the limitation. We recommend a straight run off adjoining walls, from the corner, of 1600mm each way, to be sufficient. Therefore, it is important to consider whether a straight run with unrestricted access would serve your purpose better. It can be that the shape of a bedroom can lend itself naturally to a corner wardrobe and it can be an excellent way of managing all your bedroom storage behind sliding doors. Our corner wardrobes are constructed as two separate wardrobes with one interior running into the corner. We would strongly recommend a visit from an experienced designer to go through all the pro’s and con’s of a corner wardrobe design.